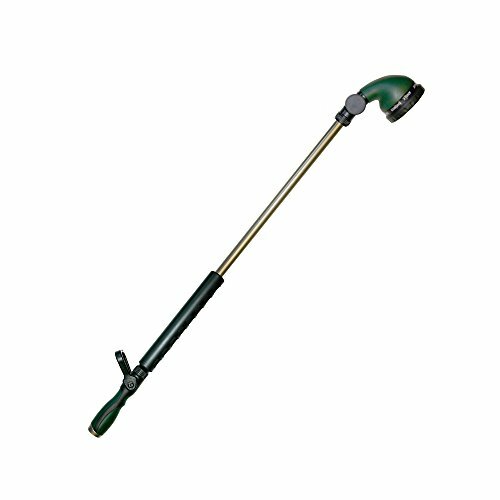 The Orbit 36-Inch Turret Wand with Ratcheting Head offers 9 spray patterns for a variety of watering needs. Its long length makes this 36" wand great for watering hanging baskets and hard-to-reach areas. Spray patterns for this turret wand include center, cone, fan, shower, angle, flat, flood, mist and jet watering. With those nine spray patterns, this turret wand is fully adjustable to fit all of your watering needs. The ratcheting head rotates 180 degrees, making for a highly versatile product, and the lever fireman grip is great for easy adjustment of water flow.